Abdus Salam Soomro, a poor cameraman must be rewarded, not only for capturing the historic, although horrifying scene of the killing of a boy, but for his courage to stand and record his statement before the Anti-Terrorism Court (ATC), which has now led to the sentence to five personnel of Rangers paramilitary force in Karachi. The Sindh High Court on December 21, 2013 upheld the ATC decision and confirmed the death sentence to one Rangers personnel, life imprisonment to four others and acquittal of one for want of evidence. The trial court had sentenced Shahid Zafar to death in August 2011. The bench observed that three eyewitnesses had categorically deposed against the appellants and identified them in court. Cameraman Soomro, who captured the scene, also fully implicated them. The accused can now filed an appeal before the Supreme Court of Pakistan and if the apex court also upholds the decision, a mercy appeal can be filed before the President of Pakistan. “The officials encircled the victim, one of them opened fire upon him twice. The young boy cried and begged for his life but he was not moved to the hospital and died due to heavy loss of blood,” the verdict stated. This upholding of the law may not have been possible had Soomro not filmed the entire scene as a journalist on duty. Hats off to him for keeping his cool without giving Rangers men any idea that their actions were been recorded. Former Chief Justice of Pakistan, Mr Iftikhar Chaudhry, took suo-moto notice of the case after Somroo’s video, initially made for his Sindhi TV channel, Awaz, which was then picked by all the news channels and described by all as ‘masterpiece journalistic evidence’ abuse of authority. The footage of the gruesome murder shocked the entire nation, but the courageous cameraman was abandoned by his organization and he was left with no other option but to leave the city and shifted to Islamabad in the face of threats and intimidation. The several-minute video showed victim Sarfraz Shah pleading with Rangers personnel not to shoot him as one of them pointed gun near his chest. Within seconds he was shot and injured. Later, it was reported that he died on his way to hospital. A few months after the incident in Benazir Shaheed Park, in Clifton neighborhood, I met Soomro at the Benazir International Airport in Islamabad while coming to Karachi. “Are you going to Karachi? I asked. “Yes, to record my statement in the court,” he said. “But have they provided any security,” I enquired. “A police official is with me,” he said. Soomro had shifted to Islamabad after his organization did not provide much needed support in his defense and security. A leading news anchor provided him a job for his courage and standing before the mighty Rangers. This young man not only made a historic video of a horrific act of abuse of authority, but when required recorded his evidence despite serious threats to his life. Many in our society are witness to criminal activities but hardly anyone shows the courage to stand up and that too in an incident where the personnel of law enforcement agencies were involved in violation of law. Soomro had spent sleepless nights for weeks and months, getting all kinds of threatening calls not to record his statement. His organization asked him to go to Islamabad, but later dumped him. Well done Soomro. Keep up your good work! 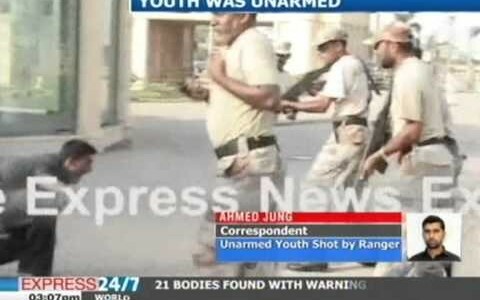 CAPTION: A TV grab shows a paramilitary Rangers soldier aims his gun at what appears unarmed youth in Karachi.